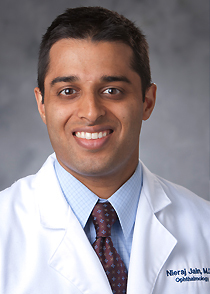 Nieraj Jain, MD, joined Emory Eye Center in March 2015 in the Vitreoretinal Surgery and Diseases service. Dr. Jain graduated from Cornell University College of Engineering with a degree in biological and environmental engineering. He received his medical degree from Duke University School of Medicine followed by an internship in internal medicine at the University of Rochester, then a residency in ophthalmology at Duke where he served as chief resident. He subsequently completed a fellowship in vitreoretinal surgery at the University of Michigan, as well as a fellowship in ophthalmic genetics at the Casey Eye Institute in Oregon where he was supported by a Career Development Award from the Foundation Fighting Blindness. His research explores the use of advanced retinal imaging modalities to assess disease progression and outcomes from novel treatments such as retinal gene therapy. He is actively engaged in interdisciplinary collaborations to broaden the application of novel imaging technologies. Dr. Jain is a member of the Alpha Omega Alpha medical honor society, the American Academy of Ophthalmology, the Association for Research in Vision and Ophthalmology and is a diplomate of the American Board of Ophthalmology. Dr. Jain was a Heed Foundation Fellow and a Howard Hughes Medical Institute Research Scholar.